In 10- or 12-inch skillet, heat oil over medium-high heat. Add beef strips; cook and stir until browned. Drain. Stir in water and Sauce Mix. Increase heat to high; heat to boiling, stirring occasionally. Stir in Pasta. Reduce heat to medium-low; cover and simmer about 10 minutes, stirring occasionally, until pasta is tender (sauce will thicken as it stands). Stir bell pepper, ground chipotle chiles, whipping cream and corn into pasta mixture. Cook about 2 minutes, stirring occasionally, until thoroughly heated. Remove from heat. 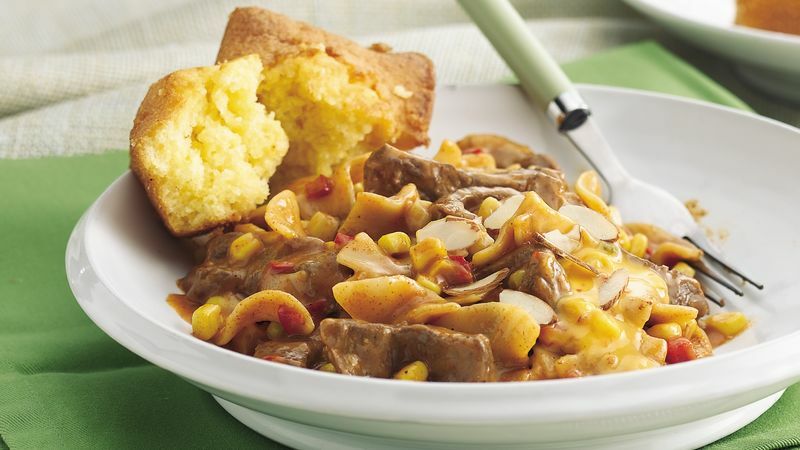 Spoon Topping over beef mixture. Sprinkle with almonds.